I can still remember toeing the line of my first 5K race. My mind was racing with energy-sucking thoughts from "What was I thinking-- I can't do this?" to "Where do I stand?" to "How do I stand?" and even "What the heck was that guy thinking when he decided on those shorts?" Needless to say, my inner gremlin was feeding off my pre-race nerves and I was doing all I could to get through the moment. First-time life events are truly special. They are filled with enough energy to light your home and can cause a grown woman to behave like a 3-year-old child. 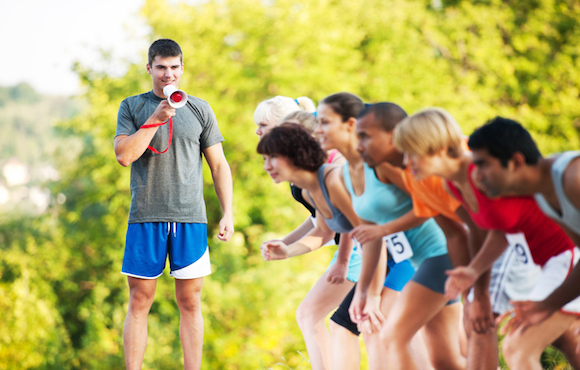 Here is a 5K race day plan to help you feel like a pro. If you're like me, you probably prefer not to be a featured star in a "Running Fails" viral YouTube video. It's much harder to be a first-timer these days with smart phones to catch your every newbie nuance. I'm sure my two mismatched socks, leg warmers and bib number pinned upside down and on my back had people cracking up at my expense when I first started. 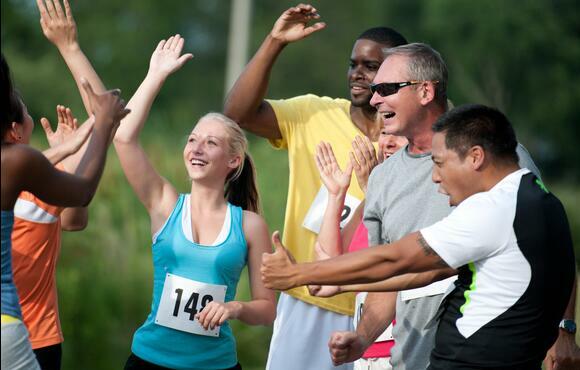 There's a simple solution here: volunteer for a race before you run one. That way, you can earn some great karma, gather intel and see how a race works. The night before the race, put on what you plan to wear. 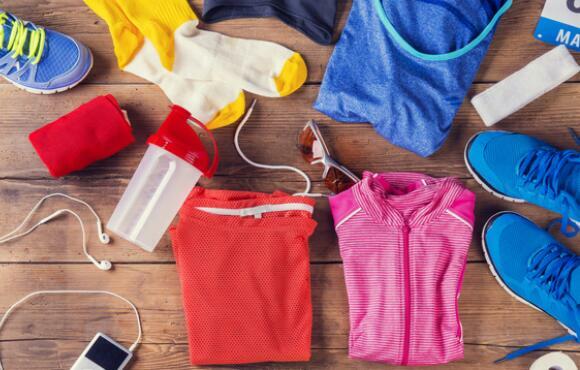 Get you bib number, timing device, costume (optional) and anything else you plan to wear or bring to the race. This will streamline your race morning logistics and keep you cool as a cucumber. There's nothing worse than having the gun go off when you're in the car, or in the porta-potty. There are already enough nerves to go around for a "first-time" event, so be kind to yourself and show up at least one hour before the race starts. This allows plenty of time to roll through the potty several times, find the start/finish area, and ease into the moment. Unless you've been covering miles at the speed of light, look for people who "look like you" and line up next to them at the race start. Standing too close to the front can cause a crash and burn moment within the first few miles. That is, you get caught up running everyone else's pace but yours and have the half-mile race of your life! The other 2.6 miles won't be so wonderful? 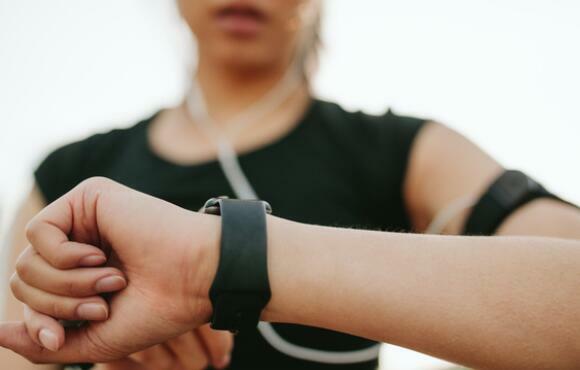 Breathe deeply from your belly, remember why you are running this race, and visually break the 5K distance into four mini-races; the first mile, the second and third, and the final .10 miles! 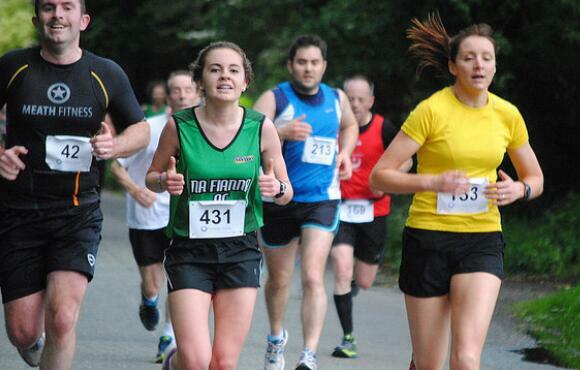 When the gun goes off at the start, focus on reaching that first mile upright and with a smile on your face. When you reach mile 1, set your sights on number two. When you fly by the 2-mile marker, think your way to three. Before you know it, you'll be sad the race is almost over and shocked at how quickly it flew by. Breaking the total sum into smaller, more digestible pieces keeps you from getting overwhelmed. The easiest way to a beautiful finish line photo is to pace yourself from the start. Take the four parts of the race (mentioned above) and color them in with Yellow (Mile One), Orange (Mile Two), Red (Mile Three) and Fire (yes this is a color and it aptly represents the final kick). Now, run by color -- rather than your watch! The body doesn't know pace. It knows effort. Run by your breath and keep it easy for the Yellow Zone (Happy) or mile 1 -- you should be able to talk. If you can't, slow down. For mile two, take it to the Orange Zone -- or at an effort level a little harder than Yellow, and an effort where you can hear your breath, but you're not gasping for air. As you run past mile two, pick it up slightly and head for mile three. This is what you've paid for, and the time to go fishing. Cast out your invisible hook and catch a runner ahead of you (one that went out too quickly and is suffering the consequences) and reel them in (nicelyJ). 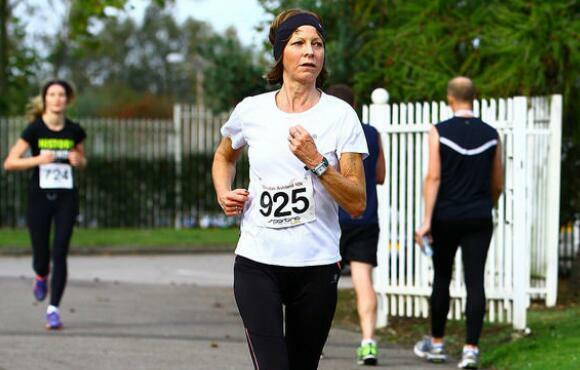 There is nothing more empowering than to pass people in the final stages of a race. When you hit mile 3, run tall, keep your effort, and prepare for your finish line dance. When you have the patience to pace yourself from within and from the start, you will have the strength to finish like a super hero. I have many running tops that bare the memories of first attempts at running through aid stations. Thank goodness tie-dye is back in. 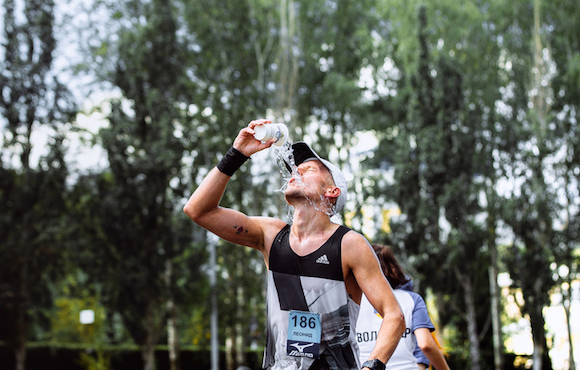 Hydration is an important element to your racing success, and it's best to invest in a few seconds to get your fuel in you -- rather than on you. Pay attention to how the stations are set up. 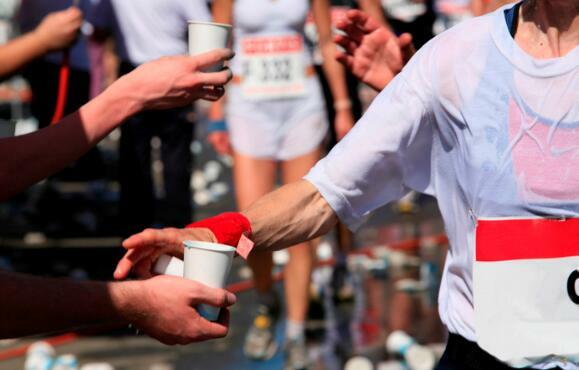 Is the water first or is the sports drink? How many tables are there? As you run into the aid station, stay in the middle of the road. Listen for what they are calling out (water or sports drink). Make eye contact with the volunteer. Walk. Grab a cup, pinch it, and drink. 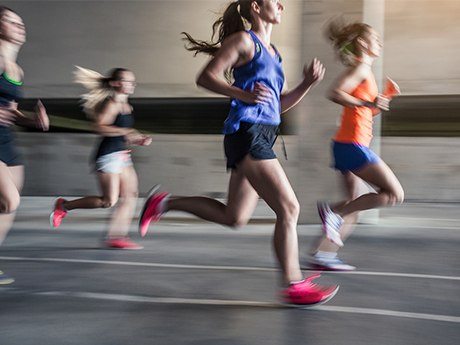 Once it's down the hatch, get back into your running tempo. If you have the energy, thank the volunteers for being there. Races would not exist without the kindness of volunteers. The shortest distance between two points is a straight or somewhat curvy line. 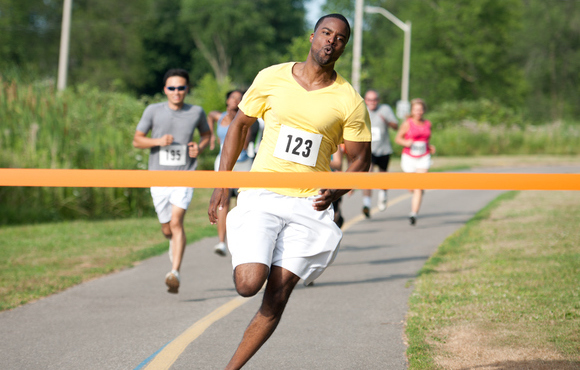 As you make your way through the 5K, be on the look-out for turn and curves and avoid taking the scenic way around as it can add distance to your race. It's also a great way to stay mindfully engaged as you navigate the course. You only get to run your first 5K once a lifetime. Take it all in, run for the finish rather than the watch, and celebrate your accomplishment. You've earned it?